Will Invisalign In Bowie Work If You Have Gum Disease or Bone Loss? Having multiple oral health problems can feel overwhelming, but it’s not uncommon (especially as we age) to have more than one issue to address. A perfect example is having gum disease while also wanting to straighten your teeth. Many adults would prefer to straighten their teeth discreetly, and Invisalign in Bowie is a wonderful way to do that. But, to get the best results, it’s important to make sure that your gums and underlying jawbone are adequately healthy beforehand. 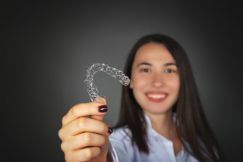 Keep reading below to learn about the many advantages of Invisalign and whether it can still work for you if you have gum disease. What Is Gum Disease and How Does It Affect Your Oral Health? Gum disease (also called periodontal disease) affects the gums and underlying bone that support the teeth and keep them in place. As it progresses, the bone that surrounds each tooth is slowly lost. In advanced cases, the teeth can even become loose or fall out. Gum disease can be mild, moderate, or advanced, and the stage you’re in will determine the current bone levels in your jaws. That’s why a dentist will start by taking X-rays and doing a simple gum examination to evaluate your gum health and bone levels. And, if you haven’t had gum therapy yet, they’ll probably recommend doing that first. Can Invisalign Work For You If You Have Gum Disease? Healthy gums are the foundation of any smile, so your gum health must be addressed first before doing orthodontic treatment. Invisalign will work for certain people with gum disease – if they have adequate bone levels and are managing their condition. But a dentist may make other recommendations if someone has advanced gum disease or it’s uncontrolled. The first step is scheduling a consultation with an Invisalign-certified dentist in Bowie to learn more about your specific needs. Improved oral hygiene – Since the clear aligner trays are removable, it’s much easier to brush and floss than with braces. That greatly reduces your risk for developing cavities or gum problems and helps your smile look great after treatment. Faster results – Each patient is unique, but the average treatment time for Invisalign is 9-18 months. For braces, it’s typically between 18-24 months. No dietary restrictions – Patients in braces have to avoid hard, sticky or crunchy foods for the entire duration of treatment. With Invisalign, you can still eat your favorite foods. More comfortable – Smooth, plastic aligners are much more comfortable than metal braces and won’t irritate your lips or cheeks. Fewer progress visits – Adults, in particular, love the convenience of having fewer progress visits. Most Invisalign patients only need to come in every 6-8 weeks. With traditional braces, it’s usually every 4 weeks. Invisalign is a wonderful alternative to braces. But, as always, the goal is to do what’s right for your oral health and make sure you get the best results possible! Dr. Clarine Green Hightower is a family dentist with nearly two decades of experience and a graduate of Howard University College of Dentistry. She knows that orthodontic treatment isn’t “one size fits all”, so she always thoroughly evaluates each patient to recommend the absolute best treatment for their needs. If you’re considering Invisalign in Bowie and have any other questions, she can be reached via her website. Comments Off on Will Invisalign In Bowie Work If You Have Gum Disease or Bone Loss?